Continuing our commitment to supporting the waste and recycling sector, we will be showcasing our range of quality forklifts and warehouse trucks at RWM, 12th - 13th September 2018 at NEC Birmingham, stand 5N20-P21. 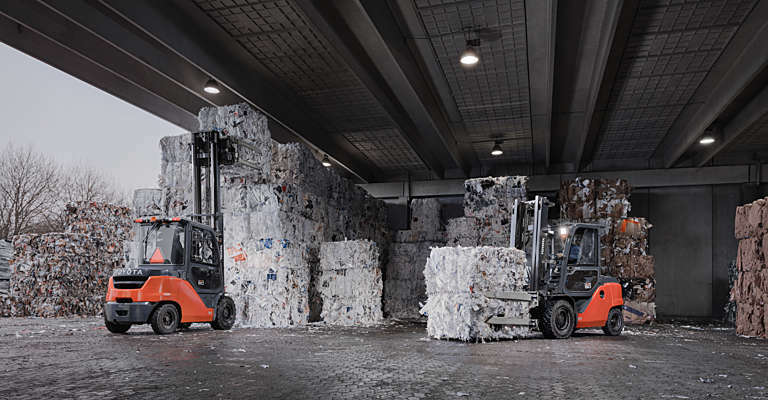 Chosen for their suitability in waste and recycling applications, the trucks on stand include: two Toyota Tonero engine-powered forklift trucks, one fitted with a waste recycling clamp and the other featuring a full steel cabin, a high capacity BT Levio powered pallet truck and a BT Lifter hand pallet truck featuring an integral weighing scale. The Tonero forklift has been developed to address key industry concerns of safety and durability. Featuring our unique System of Active Stability (SAS), the Tonero helps operators to manoeuvre the truck confidently and safely. The chassis of the truck is manufactured from heavy duty steel for maximum durability, and enclosed connectors are used to resist water and dust, allowing the Tonero to operate in tough environments.